Gullies are erosional-depositional landforms consisting of a source area (alcove), channel and apron. They occur primarily on mountain slopes and on crater walls on Mars. Morphologic attributes such as braided channels, point bars, and cut banks in many gullies suggest that fluvial processes were involved in their formation. The most plausible agent to form gullies is liquid H2O (groundwater seepage, melting of near surface ice and snow, or melting of a dust-ice layer on the surface). 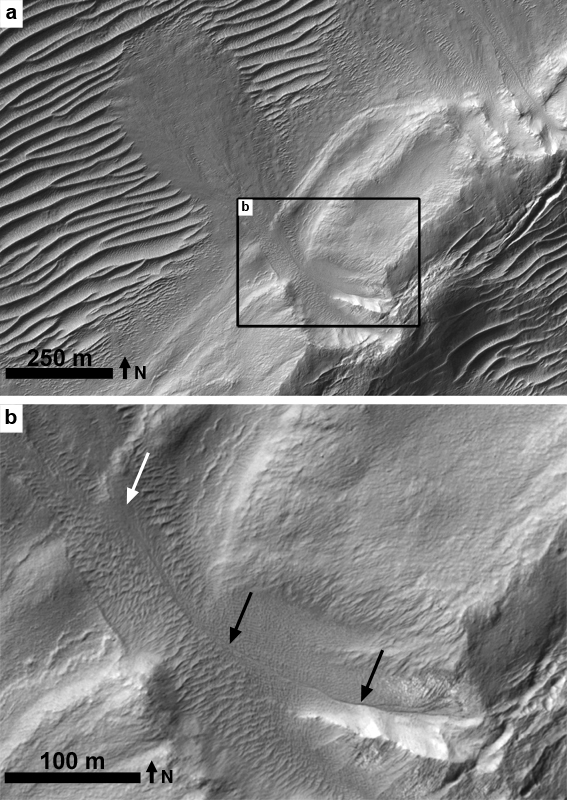 Alternative gully formation processes on Mars include the sublimation of CO2 or dry granular flows. Gullies have a wide range of ages and age determinations by crater size-frequency distribution measurements (a method used in planetary science to date surfaces via the size and frequency of impact craters) show that gullies on Mars were active in the past few million years. The gullies investigated in this study can be found in a mountainous region in the northwestern part of the Argyre basin, one of the largest impact basins on Mars (51°S and 317°E) with an age of ~3.83 Ga. Large portions of the mountainous region are covered with an atmospherically derived dust-ice mantle (Image 1). Crater size-frequency distribution measurements of this smooth appearing dust-ice mantle show an absolute model age of ~20 Ma. The young dust-ice mantle is the source material of gullies in the study region. Gullies from this mantle are likely due to the melting of its ice content. Due to the stratigraphical relationships, gullies in the study region generally have absolute model ages of less than 20 Ma. Image 2: (a) Subscene of HiRISE-image (PSP_009156_1335) showing one gully emanating from the dust-ice mantle which is also superposed on a transverse aeolian ridge field. More gullies are visible in the northeastern part of the image. (b) Close-up view of the gully channel. Small aeolian ripples are visible within the main channel. A small channel cut through these aeolian ripples (dark arrows), and the apron of this channel (white arrow) shows no aeolian ripples. One location in the study region at 46°S and 310.8°E shows an interesting example of a very young gully (Images 2a,b). 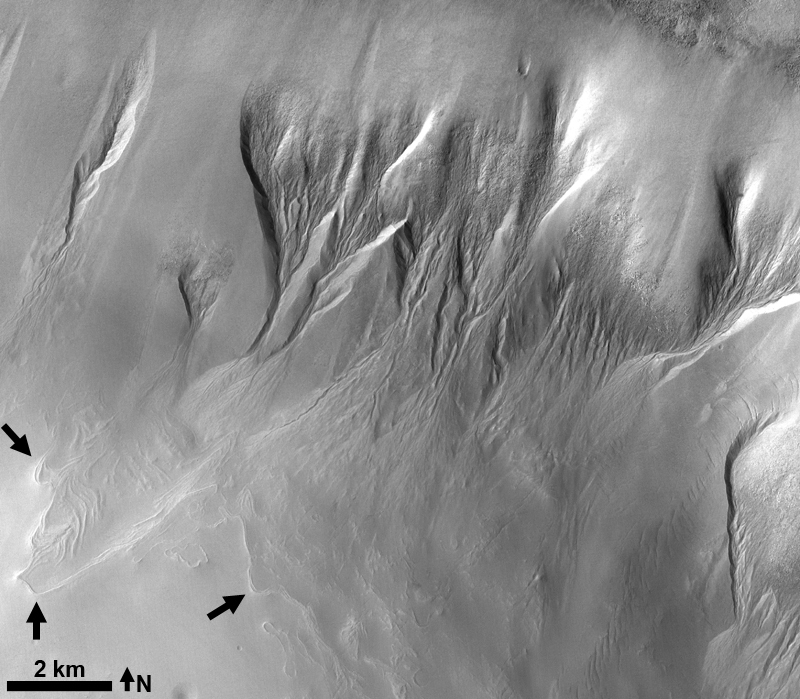 Here some gullies emanating from a viscous flow feature (indicating a modified dust-ice mantle) and are superposed on an aeolian ripple or transverse dune field (called TARs, transverse aeolian ridges, due to the unknown origin as megaripples or dunes) (Image 2a). The TAR field is not superposed by impact craters, even at a resolution of 25 cm/pxl. Age estimations for the TARs using the area covered with TARs and the cratering rate gives an upper limit absolute model age of ~500 ka. The superposition of some gullies on TARs indicates a very young formation of these gullies with ages of about <500 ka. Furthermore some small aeolian ripples are superposed on both TARs as well as gullies (Images 2a,b). These were cut by a small meter-sized channel (Image 2b), showing a very young last activity of this gully.